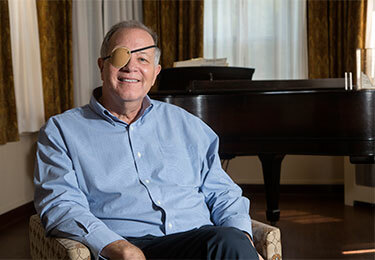 Dave Woods is more than three years into his fight against choroidal melanoma, a rare life–threatening cancer in his right eye. Shortly after his diagnosis, he made the decision: He doesn't want to die at home. Instead, he is choosing an alternative – a residential hospice. He doesn't want his wife, Fifer, to bear the burden of caring for him physically in his final days even with professional help; the emotional toll will be burden enough. Fifer's first reaction was, "Are you sure?" Convinced he is, she supports his choice. "A few months ago, I was driving home from shopping, thinking about what I should do and saw a traffic sign pointing the way to Villa Marie Claire," Dave said. "I followed the arrow, and as soon as I turned on to the street I saw this beautiful facility – immaculate landscaping with fountains and all sorts of plantings, people walking the grounds and chatting on benches, the Spanish architecture of the building. A beautiful scene." Today, the Villa, located in Saddle River, is the place where he plans on taking his last breath. Each year, choroidal melanoma is diagnosed in only about six out of 1 million Americans and for someone of Dave's age and with his type of tumor, the five-year survival rate is only about 10 percent. "I've heard good things about Villa Marie Claire during the more than thirty years that my family and I have lived in the area," Dave said. "But in all that time, including since it's been a hospice facility, I had never been there or even gone by it." Dave was so impressed by the property and staff that he asked if there was a volunteer program and, if so, could he apply. He learned that volunteers are a valued part of the Villa's care team, and now Dave comes two days a week to visit with residents and their loved ones. "I questioned my motives before I volunteered," he said. "Why was I going to do this – for self-centered reasons such as getting more comfortable with death? Scoring points with God? Looking like a hero? I concluded my motives were genuine, that I really wanted to live a line I heard years ago, 'Don't waste your cancer.' In other words, I decided I had the credibility to share with hurting people about their tough health battles and an obligation to do what I could to help them face the end of their lives with hope, peace and even contentment. And, believe me, in doing that as best as I can, I've been blessed too. In amazing ways. I've been inspired and encouraged by the Villa's residents, the devotion of their families and the dedication of the staff." Dave is uniquely able to empathize with residents who are enduring their own health battles. During the past few years he has had surgery that took his right eye, followed by a myriad of treatments, including chemotherapy, radiation, immunotherapy and a clinical trial, none of which have been successful. (His next step is a Phase I clinical trial – discussions are underway with his doctors.) With the loss of an eye, his depth perception has been affected, and he has some pain. But he says his quality of life is still very good and he is still able to focus – no pun intended, he jokes – on his family, church, the consulting work he still does, and of course, meeting residents and their loved ones at the Villa. As for his own emotional well-being, Dave isn't afraid to die. He has a strong faith, "I've seen the Lord work in real ways in my life." He knows he has a wonderful future waiting for him beyond the human experience. But what he doesn't know is what the end of his earthly life will be like: Will he be restless and anxious? Will he need pain management? Will he be unresponsive? He wanted to be at a place where clinicians have end-of-life expertise that includes not only caring for patients but also attending to their families, anticipating and responding to their questions and need for emotional support. "Don't get me wrong," Dave said. "I have my meltdowns when fear and sadness get a hold of me." To be sure, though, Dave's Christian faith brings him comfort and confidence. Other people who don't believe in a higher power or an afterlife, however, can also find peace at Villa Marie Claire, Dave feels, in knowing that they and their caregivers are being well taken care of during this most difficult of times. "This is a blessed and serene place," Dave said. "A special place to be." It is with great sadness that we share the news that Dave Woods passed away at the Villa in August 2018. As planned, he volunteered as long as he could and died peacefully surrounded by his family and friends.